It started with snowshoes . . . It got me to thinking . . . I already spend quite a bit of my personal and vocational time tending to my soul fitness. So when my husband and I sat down on 12/31 to talk about our goals for 2014 – personal, business, relationship, family – I decided that one of my big goals is to prioritize body fitness by exercising 5 days a week. I try to get to 3 zumba classes per week; but I want to add 2 more days of some other kind of exercise. When the warmer weather comes, I want to get back to running. But what to do in the wintertime? In the years since my body has been unable to keep up with downhill skiing, I’ve been thinking about snowshoeing. But I hadn’t gotten around to following up and getting what I need to do it. So on New Years Day, I headed over to EMS – happy and grateful that they were open – to finally take action and purchase some snowshoes so I could begin to realize my fitness goal as early in the new year as possible. The clerk was very helpful – showing me the snowshoes especially designed for recreational use, and the telescopic poles to help over rougher terrain. 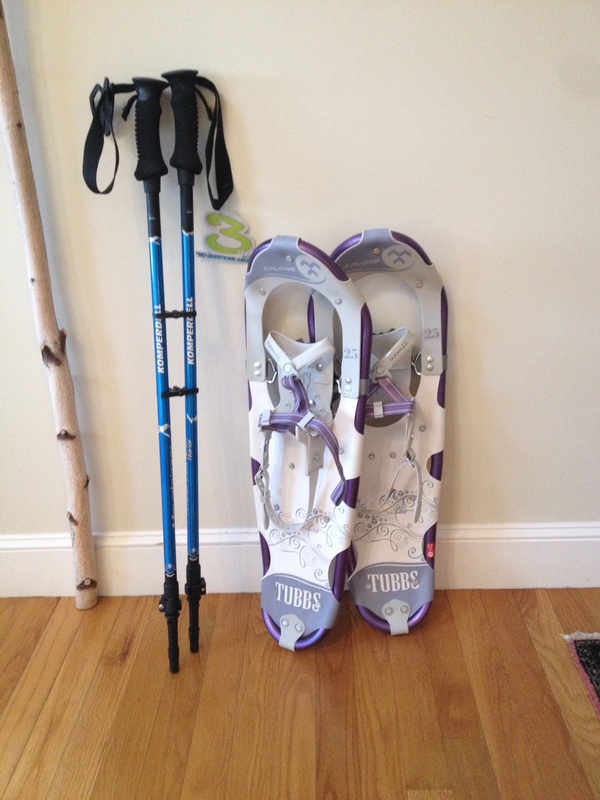 I was psyched to see that both the snowshoes and the poles were on sale – yay! The clerk was smiling as we finished up, saying “I love it when things like that happen.” I felt suddenly full and alive – aware of the energy people talk about when they are part of a ‘pay-it-forward’ chain reaction . . . aware of a generosity that is most often latent in me, but all of a sudden bursting and wanting an opportunity for expression. I went out for my first snowshoe this morning – beauty and stillness all around me. I can’t wait to go again tomorrow, and tomorrow, and . . . I’m aware that ‘fit soul, fit body’ is somehow a circle or a spiral. One leads to the other, and then to the other, and then to the other. Generosity, energy, joy, movement, gratitude, power . . . fitness . . . soul . . . body . . .
10-week program beginning February 7. Two in-person days at Bethany House of Prayer, Arlington, MA (February 7 and April 22), with three small group meetings and online work in between. I love this story Susie, now your snowshoes will be a double blessing. They’ll get you out into the snowy spirit of the woods and remind you with each step of the kindness of that day! What a great story! We got snowshoes for Christmas and went for the first time on Sunday. It was so refreshing and beautiful. We won’t grumble when it snows again! love this sus.. inspiring words to get moving… I like to tell myself- remember what you know.. Wonderful story and a wonderful blog! Thanks for sharing it, Susie! This brought tears to my eyes, Susie. You told the story so well — your writing brought me right into the experience. Thank you.